Be completely honest with me. Have you ever been reading an article when you reach the end and have no idea what you just read? Your eyes were following the words on the paper or on the screen but your brain just wasn’t processing the material. I don’t know about you, but this happens to me all the time. Sometimes I’m distracted by background noise or my surroundings; other times I just completely zone out. I can spend thirty minutes reading and if my life depended on me summarizing what I read at the end of those thirty minutes I would be completely out of luck. This is called passive reading and I am a chronic passive reader. Passive reading is when you read, but you don’t remember the details; your eyes just follow the text on the page. Generally speaking, you passive read when reading a novel. While you may remember the major plot twists, you probably don’t have a mental note that the character was wearing a green scarf on page 32 when she first met the antagonist. That is, unless the author made a big point of this green scarf. But when reading for pleasure, remembering every detail isn’t important; it’s just important that you get the general gist and plot line. However, when it comes to academics passive reading can be a real pitfall. By the time a student is a freshman in college he or she can have upwards of two to three hours of reading nightly. Failure to read the material actively can result in poor grades on tests and in-class participation. So how can students avoid the pitfall that so many of us regularly fall prey to? By implementing active reading strategies. Below are some of the best active reading strategies that students can implement beginning in middle school to avoid passive reading and to learn the material in an efficient manner. 1. Highlight, but don’t go crazy. Highlighting is my strategy of preference; however it took me a long time to master. When I first started using highlighters I would highlight everything, and I do mean EVERYTHING. A page would have more yellow on it than white. It was basically just a new take on my old passive reading ways. Nothing stood out because so much of it was highlighted. Throughout my time as an undergraduate, the way I best learned to use highlighters was with a color coding system. I would use yellow for extremely important information such as names, dates, and places (I was a history major), I would use blue for quotes that I would want to use in a paper, and I would use green for any type of vocabulary and/or an explanation of an event or idea. I kept this color code consistent with every class regardless of the content area. It allowed me to browse through my books when I had a paper or an exam to study for and easily pick out the most important material. It also kept me focused while reading. It’s likely that my color coding system won’t work for every student. Though it helped me limit my own highlighting, it did require me to carry three highlighters on me at all times (neurotic, I know). 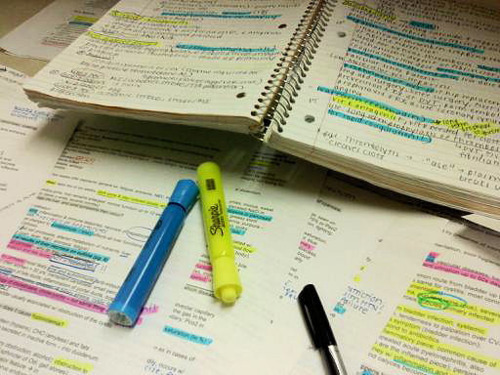 Luckily, studies have shown that the color of highlighter doesn’t matter as long as students know what to highlight. Statistically the most beneficial strategy students can employ when reading to make sure they remember the material is writing margin notes. These notes should be short little bits that help jog their memory about the content on the page. They can include a note that the teacher may have said in class regarding the same material, or a specific point the student wants to draw out. They should be short and concise to avoid spending too much time writing. One thing that has helped students I’ve worked with is summarizing. When they finish a section in their textbook they write down one or two key points to that section on a post it note and put it in the book. Then when they need to study they can quickly look at those post it notes to jog their memory. Should they have more questions, they know exactly which section to go to. A great strategy for many students is for them to question themselves. It makes them responsible for the material they’re reading and helps alert them when they’re passively reading. Students can ask themselves, “what it says” for each paragraph they read, taking Cornell Notes when necessary. Another technique to help avoid cramming information in before a big test is that while the student is reading, he or she should come up with 1-2 test/quiz questions on each section he or she reads. This allows them to think about the test material, hold themselves accountable, and prepare long before the night before the test. Many active reading strategies are easier to implement now more than ever with the switch over to e-textbooks. Fairfax County, was one of the first to make this switch with Prince William County and many DC area private schools following behind. When using an e-textbook a student can highlight with multiple colors, make margin notes, underline and even make questions. All of these notes are saved and synced electronically with their account and are accessible from any computer or tablet. Active reading is one of the most useful skills that a student can learn in secondary school. But it is important to note that it is just that: a skill. Active reading is not something that will be learned overnight; it takes time and refinement and what works for one student, may not work for another. Most students need to take a trial and error approach until they find a strategy that works perfectly for them.